Our all-weather sports surfaces provide schools with the benefit of knowing that outdoor sports activities can continue as normal despite poor weather. In doing so, they prevent many of the problems associated with bad weather, such as lack of indoor space, cancelled lessons and rescheduled matches. At the same time, artificial sports surfaces, such as artificial grass or rubber crumb surfaces, can help reduce capitation costs, as there is no need for regular upkeep: the grass will not need reseeding or cutting and the markings are permanent. In addition, many schools take advantage of all-weather sports facilities by hiring them out to local teams and sports associations in order to increase school income or by letting them be used by community groups to develop local links. Our artificial surfaces can be used with a wide range of sports, including: football, hockey, netball, cricket and even lawn tennis. They are also suitable for a range of outdoor athletics. 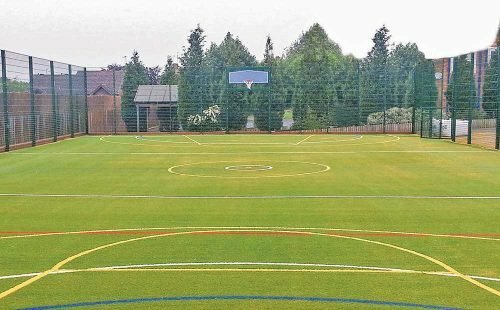 For schools with limited outdoor space or limited budgets, we are also able to provide multi-sports courts with different coloured markings for each of the sports. For your peace of mind, all of our all-weather, artificial sports surfaces are made from high quality, durable and safe materials.